Tiger and Sazzles were featured here last year — two tiny kittens found abandoned and in need of a home. 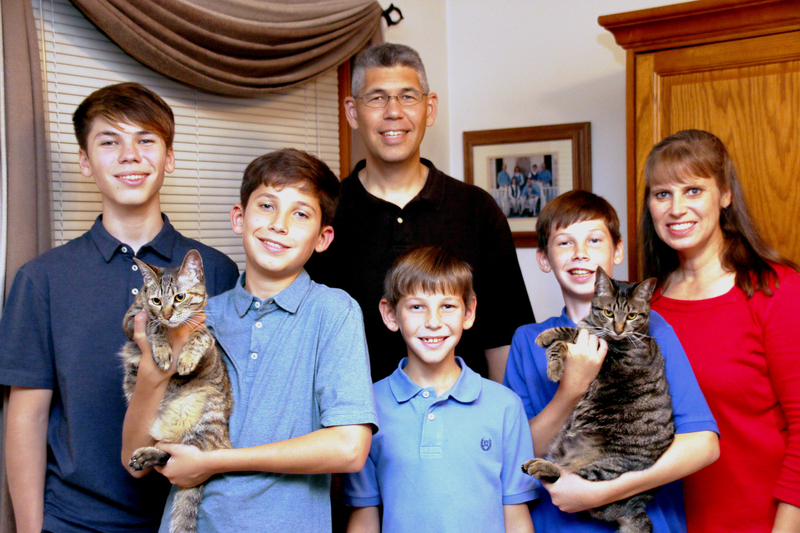 They have found a stupendous one with the Oue family in Kanagawa and are now said to be “the most loved-on, spoiled, goofy, funny cats on the planet!” Tiger and his sister Sazzles live with Americans Richard and Renae Oue and their four sons (pictured from left: Caleb, Stephen holding Sazzles, Joshua, and Timothy holding Tiger). 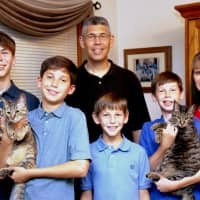 Richard began his search for a new cat for his family after their previous two cats passed away. When he and his wife met the two kittens, touted as being “people-friendly,” Renae says, “We were convinced their new home just had to be with our family.” The feline pair came home for Christmas. Tiger has always enjoyed leaping and perching on high places and Sazzles has “bonded with her inner goat” and developed an affinity for chewing on paper, headphone wires (eight pair so far) and other small cords. They have also “discovered the fascination of watching soap suds slide down the shower wall” and, most of all, “spending countless hours watching their friend Buster the hamster,” who recently survived Tiger’s learning how to open the cage!